Try out this quick to prepare and absolutely delicious chicken preparation that goes brilliantly with any carbohydrate accompaniment as a part of the main meal. A complete fuss free recipe that can be served with slices of bread, rice, mashed potatoes, pasta or enjoyed as such with a hearty salad bowl! Clean and trim the chicken nicely. Cut the chicken in to even size medium to large pieces with a sharp knife. Sprinkle ¼ teaspoon salt over the chicken pieces and rub it nicely all over. Cover and keep aside. Smash the garlic cloves slightly. Heat olive oil in a large pot on medium flame. • Add the chicken pieces to the pot and sear it nicely until golden brown in color. Flip all the chicken pieces and sear another side to golden brown. 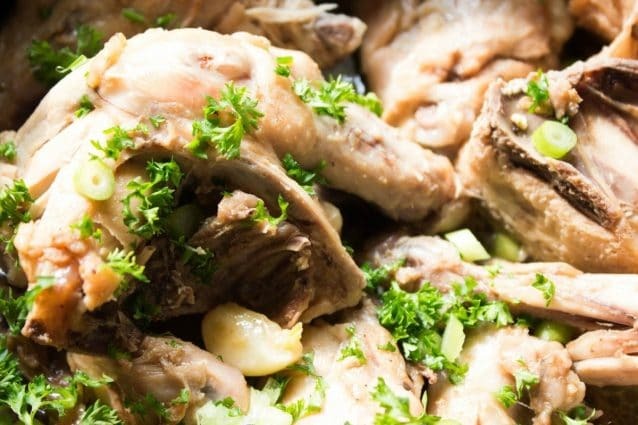 Remove chicken pieces to another bowl and add the garlic cloves to the hot oil in the same pot in which you cooked the chicken pieces. Cook garlic until golden brown in color. Pour the chicken broth in to the pot and let it boil. Add the chicken pieces, white wine and cover the pot with a lid. Cook the chicken on medium heat while stirring intermittently until 20 minutes or till the chicken cooks thoroughly. Season the chicken with the remaining salt and black pepper powder. Give it a nice stir. Sprinkle the scallion greens and parsley over the pot. Serve hot garlic chicken with rice or bread toast and enjoy! You may replace olive oil with any vegetable oil of your choice. You may adjust the chili content according to your preference by adding paprika to the cooked chicken. 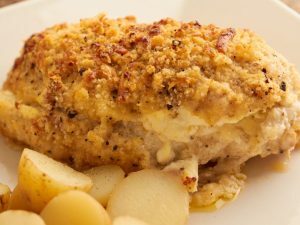 You may prepare this amazing dish with just the breast or thighs of the chicken. This preparation also turns out nicely with skinless and boneless chicken pieces cut in to small cubes. If you prefer thick sauce like consistency in your meals, you may add cornstarch slurry after step 9 and resume with step 10 as per the recipe directions. To prepare the cornstarch slurry, add 1 teaspoon of cornstarch to 1 tablespoon of water and mix it until the cornstarch dissolves nicely and no lumps are present. Brown sugar garlic chicken bites: so tasty and easy!